Whether you’re writing reports and emails for your job or just enjoy writing as a hobby there’s always room for improvement. Check out these 5 tips for how to improve writing skills to better yourself throughout the year. This post may contain affiliate links, which means if you make a purchase through one of the links below we may earn a commission fee. Thanks for your support! Writing is something I’ve always been told I’m good at. As a child, I was constantly reading in my free time which helped build a strong foundation for my love of words and writing. I really enjoy writing as I feel I can express myself much clearer in writing than through spoken words. However, I also know my writing isn’t perfect and it’s a skill I’m constantly trying to evolve and hone. While it may seem like with the digital age we are writing less and less, in some ways we are also writing more. Many of us communicate with co-workers through texts, emails, and office messaging programs instead of calling or walking over to their desk. We also have to put together work reports, project outlines, and the like. As such, I think it’s important to constantly work on our writing skills. 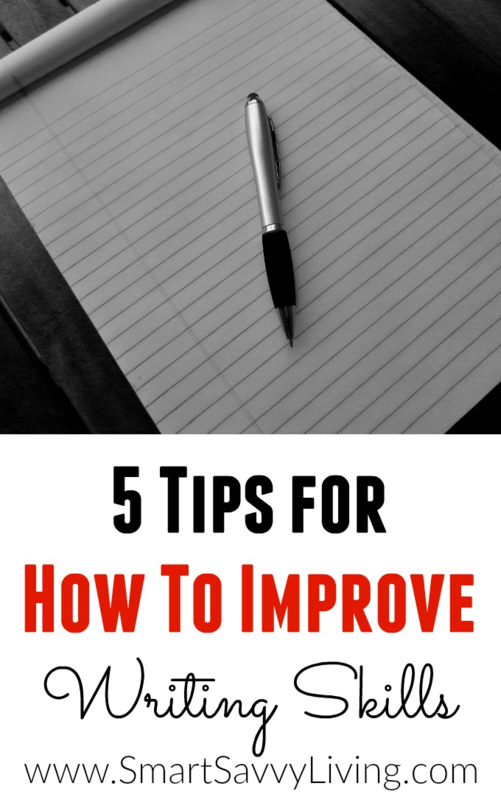 Here are 5 tips for how to improve writing skills that I use regularly. 1. Write something every day. Honestly, I think most of us can get pretty darn good at anything we repetitively do, even if we felt like we were the world’s worst at the beginning. I don’t think writing has to be something left only for those innately good at it. Sure, most of us will never be New York Best Sellers, but that doesn’t mean that we can’t eventually write well enough to further our various careers and hobbies. Writing daily will not only improve writing skills and make you more comfortable with writing but also help you develop your own unique style and tone and find the subjects you like to write about most. I like to write both digitally and in paper journals for that more personal feel now and then. 2. Make reading a habit, too. One reason I feel like writing comes more naturally to me is because I pretty much always had a book in my hand during my free time ever since I learned to read. Reading helped me to increase my vocabulary and learn sentence structure even if I didn’t know what that was at the time. Reading also helps you to see the style of writing you like and what kind of writing is most successful where. For example, writing a personal blog post isn’t quite the same as writing a fictional story. Website and newspaper articles, magazines, and books are all great reading sources. Kindle Unlimited is a great way to have access to multiple books at no extra cost other than the $9.99 monthly fee. You can even use the free Kindle app available on most devices if you don’t have a Kindle tablet. 3. Don’t worry about editing while writing. I tend to be pretty OCD about my writing when I see mistakes. I want to correct them right then and there or it will continue to annoy me until I do. However, when I do it also messes with the flow of my writing and I sometimes forget all the points I had thought of in my head that I wanted to make. It also takes a lot more time. So, I have learned and trained myself to get all the writing out first. That’s the beautiful thing about writing on a computer or other electronic device. You can go back and easily fix your mistakes without having to buy stock in wite-out. It also helps my editing be more accurate as well. Trying to edit while writing leads to more mistakes and I find myself more likely to read something as I intended to write it but it isn’t what is actually on the screen. 4. Use tools to help your writing, spelling, and grammar. Sometimes it kind of pains me to think of myself as a writer. I honestly don’t have much writing training. In school, we didn’t even have any courses on grammar! Thankfully, a lot comes naturally to me but I do feel like I’m constantly second guessing myself. That’s why I love having a variety of writing and grammar tools in my writing arsenal. Most word programs have integrated spell check these days. Some of the books I have found really useful for writing and grammar include On Writing Well and The Little Red Writing Book. However, the tool I currently use and love most right now is Grammarly. 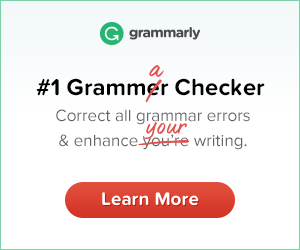 I love Grammarly because not only does it correct spelling, but, as the name suggests, it also helps with grammar. Again, since I’ve never really learned grammar, this helps me not second guess myself so much in my writing. There are free and paid versions, which adds more features like finding sentence structure issues and suggestions for more effective vocabulary issues. There’s a Chrome browser extension you can install to proofread right in the browser and you can also install the Windows program to get proofreading in Mircosoft Word, email clients, etc. 5. Read and edit your past work. While this may be the last tip, reading and editing your past work is honestly one of the most important tips for me. I like to regularly go back to past articles here on Smart Savvy Living and update the information to be current and correct any issues I find. I can’t tell you how many times I read things I’ve written and can’t believe I actually wrote something that way a couple of years ago. Or that someone didn’t call me out on using the wrong word, spelling, etc. It just goes to show you how much your writing can change and improve as you practice!